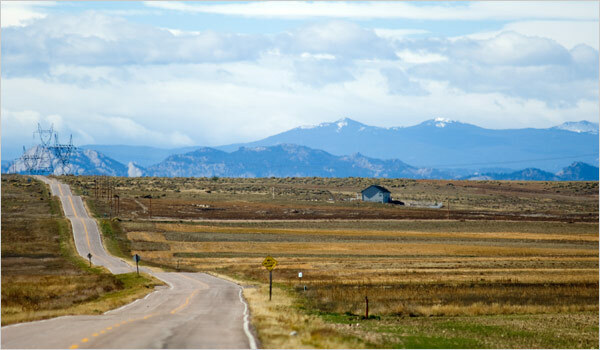 Today the New York Times revealed plans by Powertech Uranium Corp. to mine uranium just outside Fort Collins, Colorado. The story contrasts Powertech's plans with emerging efforts by city leaders and Colorado State University to craft a "green" image for the city. The story was also picked up by the International Herald Tribune. The combined worldwide print and online audience of the two newspapers is 21 million people. In 2006, Money magazine declared Fort Collins the "Best Place To Live" in the United States. A year later, Fort Collins is faced with the possibility of open pit uranium mining 11 miles from Old Town Plaza, Colorado State University, Martinez Park, the Poudre River, numerous schools, and thousands of homes. There is no precedent for siting a uranium mine so close to a heavily-populated area such as Fort Collins. The New York Times writer appears to perpetuate the myth that no carbon is emitted during the process of generating electricity by nuclear reactors. He then implies that environmentally-aware Fort Collins residents should fight global warming by not opposing uranium mining. Unfortunately, he fails to mention the process includes the mining, transport, milling, and enrichment of uranium, the reclamation and remediation of mine sites, the construction of power plants and nuclear waste repositories, the decommissioning of nuclear power plants, and the monitoring or reprocessing of spent fuel rods, all of which result in carbon emissions as well as other environmental impacts. While at least two members of the Fort Collins City Council have publicly expressed concerns about Powertech's plans, no resolution has been brought forward for consideration. It has been reported that city staff is conducting a technical review of the proposed project. So far, no city boards or commissions have rendered an opinion. No officials from Colorado State University have publicly commented on the proposal. However, the university's website includes a page critical of Powertech opponents. The page was presumably constructed by professors and graduate students in the Department of Environmental & Radiological Health Sciences, and includes selective, misleading, and unsupported assertions, as well as references to irrelevant scientific papers. 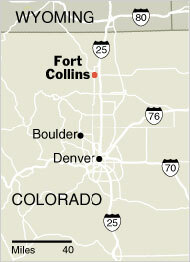 - The southernmost part of the proposed mining area is 6-7 miles from the city limits of Fort Collins, not ten miles. - The southern half of the project would likely be exploited by conventional open pit mines, not in-situ leaching. - The price Powertech paid Anadarko Petroleum Corp. for uranium mining rights is spelled out in detail in the contract posted on this site. - Lane Douglas is no longer employed by Powertech. A uranium mine proposed for the plains 10 miles outside Fort Collins, Colo., would drill down through part of an aquifer. FORT COLLINS, Colo. — This city takes pride in being green, from its official motto, “Where renewal is a way of life,” to its Climate Wise energy program, which helps local businesses reduce the carbon emissions that scientists say can contribute to global warming. Scientists tested the chemistry of the groundwater at the planned mine site. Both projects would do exactly what the city proclaims it wants, helping to produce zero-carbon energy. But one involves crowd-pleasing, feel-good solar power, and the other is a uranium mine, which has a base of support here about as big as a pinkie. Environmentalism and local politics have collided with a broader ethical and moral debate about the good of the planet, and whether some places could or should be called upon to sacrifice for their high-minded goals. The solar project, called AVA Solar, plans to use a new manufacturing process developed at Colorado State University here to make panels for electricity generation, and will use cadmium — a hazardous metal linked to cancer — as part of the industrial process. Some politicians who agree on almost nothing else have united in expressing concerns about the mine — especially its possible effect on water quality — including Representative Marilyn Musgrave, a Republican who represents the area, and Senator Ken Salazar, a Democrat. “I think nuclear needs to be on the table, and we need to work through this thing and we can’t just emotionally react to it,” Mr. Bihn said in an interview at Mugs Coffee Lounge, an environmentally correct cafe near the university, where the take-out forks are biodegradable. Asked about his own emotional reaction to the mining plan, Mr. Bihn paused. “Deep down inside, my emotional reaction is that we should never do this,” he said. The central thorn in Fort Collins’s dilemma, some land-use and energy experts say, is that local and global simply do not mean what they once did. Gov. Bill Ritter Jr., a Democrat who was elected last year and who has made what he calls “the new energy economy” a centerpiece of his administration, does not include uranium mining in the green portfolio, said Tom Plant, the director of the governor’s energy office. Mine regulators still handle questions about uranium, Mr. Plant said. There is no doubt that new money is chasing new energy. Company officials at Powertech, which is based in Denver, said they had spent more than $2 million so far buying land, or the option to buy, in the area where their proposed drilling would take place. They bought the minerals beneath the surface last year for an undisclosed price, and under what is called “split estate,” that gives them title to the uranium, no matter who owns the land on top of it. Test drilling in the 1970s confirmed the existence of about 9.7 million pounds of uranium in deposits under 5,700 acres, according to the company’s Web site. At the current market price, which has risen about 30 percent in the last year, the ore would be worth about $860 million. Mr. Cattany said that 10 other uranium projects — all involving the possible reopening of mothballed mines that use traditional open cut or underground methods, and all on the state’s less-populated western side — had come into a formal review or staff consideration over the last year as uranium prices shot up. Powertech has proposed using what is called in-situ mining — chemicals are injected into the ground, releasing the uranium, which is then pumped to the surface. The process was developed in the 1950s and 1960s, but has never been used in Colorado for commercial mining, state officials said. “We’re not hurting,” said Russ Kanjorski, the director of strategic planning for AVA Solar. Mr. Kanjorski declined to say how much the start-up costs might be for a factory, but said the company intended to build up to a production level of 4.5 million solar panels a year beginning in 2009, employing up to 500 people, mostly engineers. “Funding is not an issue for us,” he said. Jeff Lebesch, another member of the city’s utility board, said he worried that the popularity of some energy projects could make for bad public policy. “I think there is a risk that the popular ones have some things overlooked,” said Mr. Lebesch, who is also a co-founder and president of New Belgium Brewing, a 16-year-old company that has been a leader in pushing energy conservation and renewable sources like wind power. As for nuclear power, Mr. Lebesch said he was not opposed, if the energy was really needed. “The big issue of power plants is carbon emissions,” he said, “and nuclear plants don’t have them.” The fuel is the bigger issue for him. Extracting uranium, processing it and disposing of it, he said, all have long-term, unresolved questions. A spokesman for Powertech, Lane Douglas, said the company’s proposal should be judged on facts, not beliefs or prejudices or what he conceded was a spotty environmental record for uranium mining. The Fort Collins Dilemma: Nuclear or Solar?